Jody Butterfield and Allan Savory are working on a new edition of Holistic Management and I have been asked to be part of the review committee that reads chapters for general feedback. It is an honor to be part of the group helping communicate Allan and Jody’s great work. The first chapters we reviewed explained the four key insights that inform Holistic Management. The first insight is that of Holism–that nature and complex systems function in wholes not parts. I understand this concept, but there seems to be a disconnect (in me and others–perhaps the human brain is just wired this way) between understanding this principle and applying it to my management decisions, to real life. I find so often we are excited by these concepts because we they resonate deeply with us. But then we stand paralyzed with blank stares when asked to now incorporate these ideas into our real lives. Let’s talk about how the insight of holism would play out in a management situation. Let’s then look at how this compares to traditional or linear thinking in management situations. Abbey Smith and Jody Butterfield near Allan and Jody’s home in Zimbabwe. Abbey Smith, Allan Savory, Spencer Smith near Allan’s home in Zimbabwe. This concept is easier to understand from an ecological viewpoint. The term holism was defined in the 1920s by Jan Christian Smuts, a South African statesman. He said the world is not made up of substance, but of flexible, changing patterns (Holistic Management pg. 19). Individual parts do not exist in nature, only wholes and these form and shape each other. The concept of holism deeply influenced Smuts’ policy as well. Holism applies not only to ecology but any complex, self-organizing system. Spencer and I discussed holism this afternoon and in our own words, the impact of holism is that natural systems are complex and self-organizing. Everything has a job or a role to play in a self-organizing system. If you alter this system there are unintended consequences in terms of how the system will respond. It does not stop functioning (as a watch or any other machine would if you remove a part). It may function at a higher or lower capacity (which we must observe to find out), but it will continue to function. Because of the unintended consequences inherent in managing complex systems, we must approach management differently. Should we apply dewormer to our cattle in order to remove parasites and improve health and rate of gain in the cattle? From the mechanical or linear perspective the problem is that we have parasites in our herd of cattle. These parasites make our cattle sick and unhealthy looking. Also, they don’t gain much weight when they have significant parasite loads. Since we are in the business of selling pounds of beef, this is detrimental to our bottom line. The solution? Get rid of the parasites. The tool to do so: dewormers like Ivomec. We apply the dewormer, the cattle get sleek, fat and healthy. Problem solved…(or was it?) 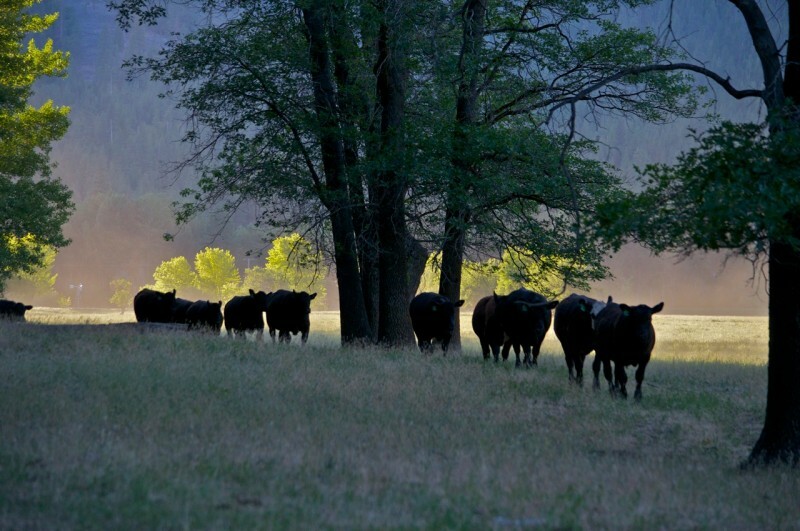 Viewed holistically, the cattle are one part of the whole ecosystem. They impact the grass, the soil, the microbes in the soil, etc. They have a job to do. So do the small organisms in the ecosystem. We know if we apply dewormers that they will impact the balance of the whole ecosystem. One creature negatively impacted by dewormers is the dung beetle. This bug works to break up manure and incorporate it into the soil. Dewormers kills dung beetles. Now there are no dung beetles to break up manure and carry it underground. So manure sits undisturbed, which is the perfect host environment for new parasites unaffected by the dewormer (as the dewormer will only last for a few days/weeks in the cows system) to lay their eggs. So we have actually not removed the problem of heavy parasite load in the ecosystem and probably ensured that we will be investing in dewormers on a regular basis. We have altered the whole ecosystem process–making it less efficient. From a perspective of holism, we would consider the lifecycle of the parasite in our holistic grazing plan and manage accordingly. The parasite load in fields are in the bottom end of the grass canopy (closer to the ground). Planning grazing to not have cattle graze this deep into the grass canopy removes cattle exposure to these parasites. Healthy cattle are less susceptible to parasites, so planning grazing for the health of the cattle is another way to prevent heavy parasite loads in cattle. Spencer and I have never wormed our cattle and we produce healthy, fat calves each year. Planned grazing allows for the whole ecosystem to improve and thrive. A certain species in an ecosystem is in decline. Should we alter the ecosystem to save it? In Southern Nevada and Arizona, ecologists found that the desert tortoise numbers were declining. They observed that the tortoises were eating green cow manure and concluded that the cattle ate all the feed available and the tortoise was forced to eat manure to survive. The decision was made to remove livestock from the tortoise habitat. The cattle were promptly removed and yet the tortoise numbers continued to decline. The tortoises in fact needed the moist and partially decomposed food. They had evolved to be dung eaters. Removing the cattle had the unintended consequence of removing the source of food for the desert tortoise. Should I take exogenous hormones in order to regulate cycles and systems in my body? In 2012, when I first sought treatment for “hormonal disregulation,” like most women, I went to my OBGYN. I learned quickly, much to my frustration (and that of many women) that the only tool in the toolbox there was drugs (exogenous, or external to my system, hormones). After failed attempt after failed attempt, the solution was always more drugs. Higher dosages. More potent prescriptions. I can clearly recall the reproductive endocrinologist telling me point blank that I should not try to “go get some herbs” or heal myself, the only way I would ever “cycle normally is with the use of drugs.” Of course it is my mission now to prove him wrong. I learned after parting ways with conventional medicine that not only was my endocrine system affected by these hormones, but also my gut microflora. Leaky gut is the root cause of most autoimmune conditions. As someone with Hashimotos Thyroiditis, taking exogenous hormones to try to regulate my endocrine system actually worsened the root cause of this autoimmune condition. My traditional/conventional doctor viewed my endocrine system as separate from the other systems in my body. But as a complex system, when we altered one system through inputs it had unintended consequences on the system as a whole. I am now working with Dr. Nett from the California Center for Functional Medicine to address the root cause of my system disregulations. I chose to work with her and Chris Kresser because of their holistic view of human health. Speaking of health, our diet and lifestyle clearly has an impact on health. But which diet and which lifestyle is right? Experts tell us to run, to not run, to do high impact exercises, to walk, to eat meat, to not eat meat…it is maddening (to quote my mother)! Thankfully the term bio-individuality is gaining momentum. It means that each person is unique. One diet that may be fantastic for one person would be disastrous for another. Finally we are attempting to understand the complexity of our systems and the many other organisms that make us, us and manage our bodies as unique, whole systems. I heard a fantastic UndergroundWellness.com podcast recently on the topic of the complexity of managing human health with the author of Kale and Coffee. He set out on a journey to discover what health truly meant by studying the healthiest people in the world. One of his findings really stuck with me. He said, the healthiest people were one with their environment. They ate local food, they had lived in that geographic region for generations so their immune systems were well adept to that environment and they were connected to the environment through their family and spirituality. So it all gets back to Smuts, holism and what he acknowledged so many years ago: “We are indeed one with Nature. Her genetic fibers run through all our being…” (Holistic Management pg. 20). What questions do you have about practical applications of holistic management concepts? Contact us to discuss!